Thanks for the encouragement on Wednesday's post. The succulents I planted are still alive which is impressive in this house. I tend to kill succulents faster than they would die naturally if you dumped them out. I've finally gotten my jog back on. I want to train for the Congress Avenue Mile in Austin, but I tend to get injured whenever I train for races. I can jog and jog and jog but as soon as I think the words "training plan," I swear an old injury will start twinging. Kallah posted her injury proof running plan. 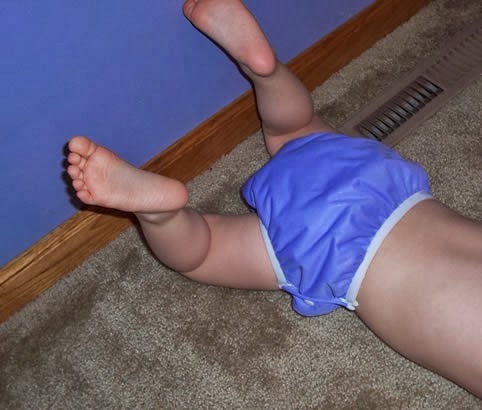 For my runner readers (especially those with experience jumping back into running postpartum): what do you do to avoid injury? Jake is seeming so much older to me. I suppose having a second baby will do that to a mother. The other day he was outside arguing with his imaginary friend about who's turn it was. When I hug him, he's taken to patting my head and saying: "You're a good girl, mama." He fake laughs a lot, basically whenever we laugh about something he fake laughs and then asks, "Excuse me, Papa, why is that funny?" I can't tell if this means he's destined for comedy or decidedly NOT destined for comedy. But older seeming or not he still mispronounces things - and mispronunciations are among the best parts of parenting. And though it's been a long time since we've used "bluebabies" or "strawbabies" in our fruit smoothies, and "roghut" may now be a more correct if laborious "yooohgerrt," no, Jake, this is Mass, this is not a "bathtizing." Lucy June is ever still a mama's girl. This is still the best and worst thing about my life. I suppose that's why God made every phase of parenting so temporary. We're about to run out of my favorite diaper cream . I got outfitted with it via baby showers when Jake was born and I LOVE it, but now that I need to replace it, I'm royally balking at the price. $9.00 an ounce!?! That's like $4.50 per tablespoon!? I'm a bit of a DIY for better or worse type, so I thought I'd give it a try. 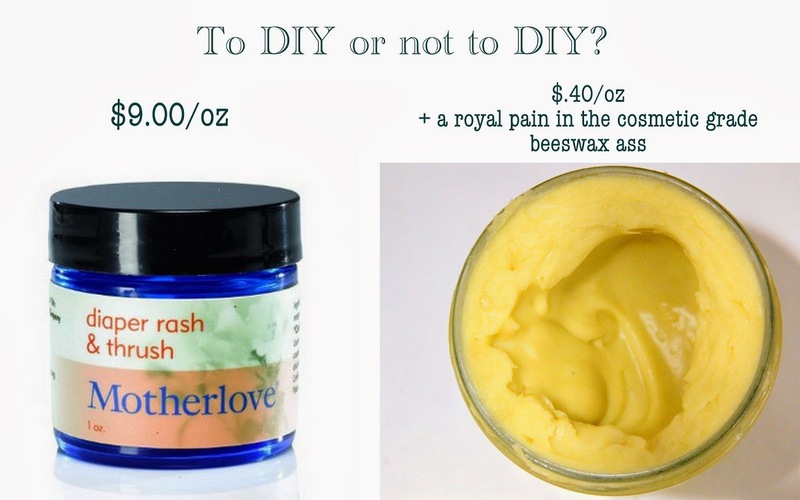 The two main ingredients are olive oil and beeswax, and since my babies really aren't that rashy, I decided to make do with just those two and skip the fancy calendula-type stuff. I didn't intend to make very much of it, but my ratio was very off at the beginning, and as I attempted to save my efforts, my batch kept getting bigger and bigger until I had a cup and a half of the stuff. 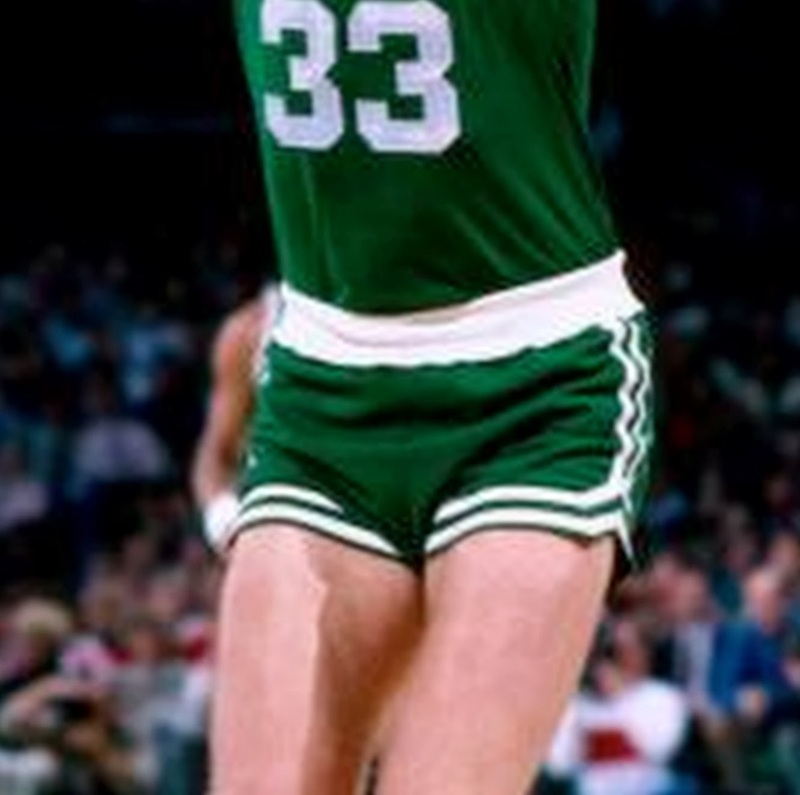 My rookie efforts were pretty messy. Simply melting the ingredients together didn't get me the consistency I wanted, so I kept graduating my mixing tools from spoon to fork to whisk to immersion blender. Ultimately, I was left with a usable product that seems like it will work almost as well my beloved diaper cream...and enough of it to last until Lucy June turns 12. Happy Fish Day! Visit Jen's for more takes. This morning was a tough one. We woke up to two needy babies and had to change our Mass plans last minute because we were running late. Thank you, Jacob, for getting both kids ready so I could take a real shower. Mass was trying. Lucy June is moving into a squealing phase, and we got fenced into the middle of a pew, so I lost my easy exit. I was tired after a late and much interrupted night. My lower back was hurting, and I was getting no reprieve as I walked my baby in the back of the church. I didn't really get to hear the homily and I hardly could focus on the readings, but I want to say thank you to some people who I will remember. Thank you to the couple in our pew who I had to scoot past eight different times with a screeching five month old. You welcomed me every time I came back in hopes that maybe this time the baby would be quiet, only to be stepping on your toes on my way back out just minutes later. You didn't make me feel bad at all because you were awesome. Thank you to the grandmotherly woman who caught my eye as I walked the babe in the back of church. Thank you for looking at me. So many people look at my kids - and I love that and all - but you looked at me, and your knowing smile spoke such encouragement. Enter Boomtown. It's not in our neck of the woods, but the espresso is delicious. It's in a part of Houston that has a Portland vibe. Urban adorable. I kind of hate that I love it. You did right by us today, Boomtown. Thank you, barista, for making me such a perfect latte. It's Lent and all, so I'm down to once a week for this deliciousness, and, buddy, you came through. Thank you to the man who was such a champ when Jake ran into your elbow and caused you to spill your coffee in your lap. He was just a little too excited about his straw, and you got that. I pegged you as such a trendy Joe enjoying your usual four shot latte at this chic coffee shop, but you surprised me and became a hero. You wouldn't let me get you another coffee. You even made jokes and laughed good-naturedly when I offered to buy you a cookie because I thought you were six years old or something. Thank you, Lucy June for staying marginally happy in your car seat so I could snuggle back into the couch and hold my latte with two hands for a few minutes. You're awesome sauce. You really bailed me out, kid. Linking up with Hallie for some favoriting today. I certainly don't need to reiterate that I'm not a chef. In Los Angeles I had this little troupe of grad school buddies (Hi Ruth! Hi Wendy!) who were kind of foodies (You were. You are. Be honest) and we would go to fun restaurants and share the best food at each others' houses. I would always get a little nervous making food for them, so I tried to avoid it as often as possible. I cooked for them only a few times. One of those times I think I made a pasta with wilted greens. Very bad idea. Grazie for nothing, Giada. So with that intro, I will now tell you my favorite kitchen utensils. And not just any spatula. THIS SPATULA. I think I use it every time I'm at the stove. If it's dirty, I will wash it before I reach for a substitute. It's that awesome. I grew up also calling these spatulas, but Jacob calls them rubber scrapers. We argue about this divergence like we argue about most things. We have this set of three, and I use them frequently. But the green one is my favorite. I'll stir my sauteeing onions with it. I'll grab it to fish out the last bit of jam. The pink spoonula thing that comes in the set is not my favorite, but c'est la packaged deal. We like to make our own chai tea which involves grinding lots of spices. I used to use a rolling pin. It was tedious but it mostly worked fine except for the cinnamon sticks which, if you managed to even break them, would torpedo all over the kitchen. Time consuming AND hazardous. Jacob got me a mortar and pestle for Christmas, and it's the funnest. It can crush a cinnamon stick like an egg shell. So, while I certainly don't use this everyday, it sits on my counter looking beautiful, and I get so excited whenever I do use it. I hadn't used a funnel in my kitchen till like a year ago. I was always one of those "I'll just aim really well and be very very careful and then clean up the mess afterwards instead of getting yet another utensil dirty" kind of people, but Jacob is a funnel person and he bought us one, and now I'm a convert. As I grabbed the image above I realized there are such things as funnels with strainers?? And dry goods funnels? What is all this amazingness? I want to be a baker of bread. Right now I have a reader (Hi Kris!!!) graciously coaching me through some bread baking via email because she offered and I'm determined if mediocre at the whole business. But the only sure fire thing about my bread baking is that every time I try try again I get to use this Danish Dough Whisk, and my if it doesn't make up for all my paltry proofing. What are your favorite cookin in the kitchen must haves?? Visit Hallie for more favorites. Jen's Quick Takes were such a good idea. I can't tell you how many times I've stared back at a week of postless days and told myself that I could manage seven blurbs. So here I go. Though I realize you're hardly inclined to take tips from my kitchen after I outed myself as a maker of flaxseed pancakes, I'll give you something more palatable: banana blueberry baked oatmeal. I've been making this recipe for a while now, and we love it. It is the number one Google search for "baked oatmeal" because I'm all kinds of original. When I make it, I up the salt to a scant teaspoon, I cut the cinnamon in half, I use half coconut milk and half water, and I skip the sugar because the bananas make it pretty sweet. 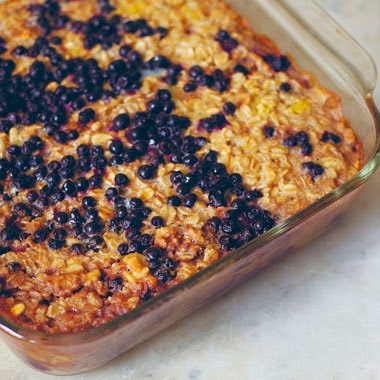 Jacob recently admitted to liking this baked oatmeal recipe better (ahem...the #2 Google hit for "baked oatmeal.") It's a southern staple. And it is very good. But it's basically like eating a cookie for breakfast. To which he would respond: "Exactly." So, kale. I've spent half of my adult life trying to find the best dressing for kale salad. Kale is tough for salads. Even when it's pretty tender, it's tough. I've massaged and marinated, even blanched and sauteed, and was never pleased and often left eating my cold wilted effort by myself after Jacob turned his nose up at it. But a few months ago an old family friend e-mailed me a link to what has proven to be THE BEST kale salad I've ever tried (Thanks, Joanie!!) So how does one get light and crunchy kale leaves in her salad? VOILA. Try it and then come back and thank me. My friend Blythe is posting again after a I don't know how many years. You should definitely visit. She's basically my favorite. Ever. I'm trying to figure out how to post on the blog more regularly. Posts are five times easier to write if I have any pictures from our real camera to go with them. My iPhone pics don't inspire me because my camera skills are nonexistent. My husband's camera has an awesome lens, and it helps me fake my way into decent pictures. I intend to learn more about using his camera someday, but until then I'm just going to be intimidated whenever anyone starts using technical language like "shutter speed" or "aperture." We've put Jake on a fast from our devices in honor of the season, and driving in the car today, he told his father he needed a special "Lent iPad." Jacob has been working super hard. He took off March 2nd for the baby's baptism, and we calculated that it was his first full day off since January 1st. His next day off will be in late March and after that things should settle down. We're grateful for the work, but Lordy, has it been busy. The other day he was home with enough time to embark on some handyman project in the house and asked: "What house project is most time sensitive that I get to? Do you want me to put the shelves in our closet or do you want me to finish my workbench?" 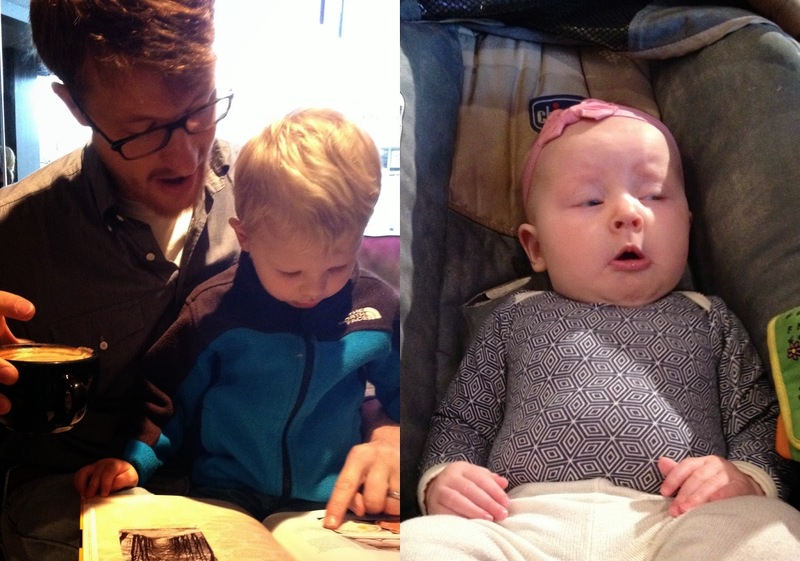 When Jacob was proofreading my post about Lucy June's baptism (specifically the escaped toddler part) to check for typos, he said: "What about the error of your entire perspective on the situation?" Start your own blog, babe. So I suppose I've been making this recipe long enough to pass it along. I shall start by saying we don't practice a grain free lifestyle. I am very much NOT #againstallgrain. I love love lovity love grain. But I know a lot of people with real deal sensitivities and a lot more kids with even bigger sensitivities and in an effort not to test our luck I try to keep the real zingers, like wheat, to a minimum in this house. Think steaming french bread or fresh crunchy ciabatta over sandwich bread. (So by minimum, maybe I mean maximum.) I just make sure that wheat products fall in the quality over quantity category over here and that we steer our spaghetti and red sauce more toward pasta bolognese. I have a very calculated algorithm that I use to determine what's *worth* eating. It's not groundbreaking or anything, and I imagine it isn't unique at all. If something is very good for me then it doesn't have to taste very good for me to enjoy it (beets). If something is bad for me then it has to taste utterly delicious or I can't enjoy it (a crispy chocolate croissant). When things are both healthful and delicious then my enjoyment level goes off the chart (avocados). I just wrote two sentences that went on in this mostly pointless vein, and I deleted them. You're welcome. So we start with pancakes. I love pancakes. Whenever we have cultured buttermilk, I will go all in with old school fluffy pancakes, but for our weekday fare, when pancakes are just a vehicle for things like syrup or yogurt or fruit, I whip up these bad boys. My mother originally sent me the recipe, and I think she found hers in William Davis's book Wheat Belly, and I've tweaked it and this is what I do. Mix all your ingredients together and cook'em up in a hot hot pan. I usually mix mine in our blender. I use the blender to grind the whole flaxseeds and then I add all the ingredients except the baking soda and blend some more. I stop the blender and sprinkle in the baking soda, then I either stir it in or turn the blender on low for a couple seconds. I pour them straight from the blender into the pan. Altogether a very straightforward and easy breakfast, but it took a little practice before I was making them to my satisfaction, so if at first you don't succeed...add extra maple syrup. The first time my mother served these I was pretty skeptical. 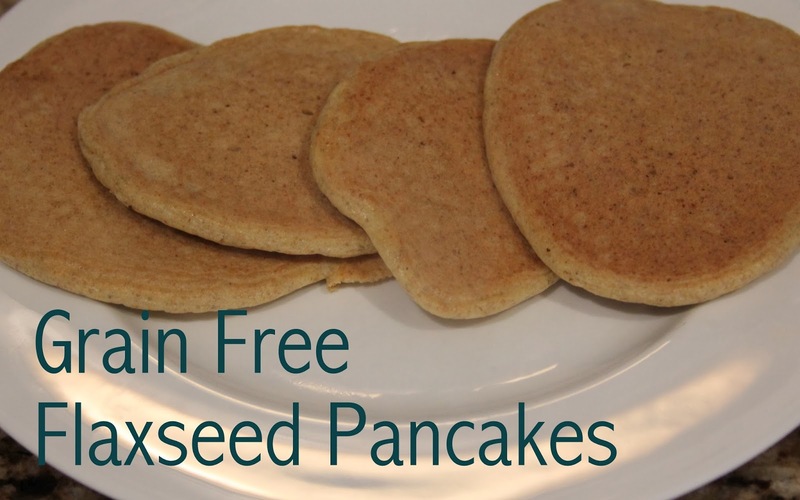 I've tried my hand at various grain free pancakes - typically involving coconut flour - and I've never liked them enough to try them again, but these are surprisingly good considering the ingredients and do a bang up job of serving as a boat for syrup and yogurt. My husband and my brother, who typically don't stand for this kind of thing, both admit that they aren't that bad (We'll take it! ), and Jakeboy hasn't even noticed that they're different from regular pancakes (For the win!). I'm sure it's not news to you that flaxseeds are good for you. I'm pretty sure I read that in Shape in like 2002 - once a trendy healthfood addict always a trendy healthfood addict, so I can say that flaxseeds have been quite cool for quite awhile. Their omega 3 fatty acids maintain their health benefits even after being heated to high temperatures. They're chock full of fiber, phytonutrients, antioxidants and all kinds of other healthful things that the French think Americans are stupid for caring about. Go forth. Try them. Hope that your palate is as lacking in discernment as my toddler's and enjoy! 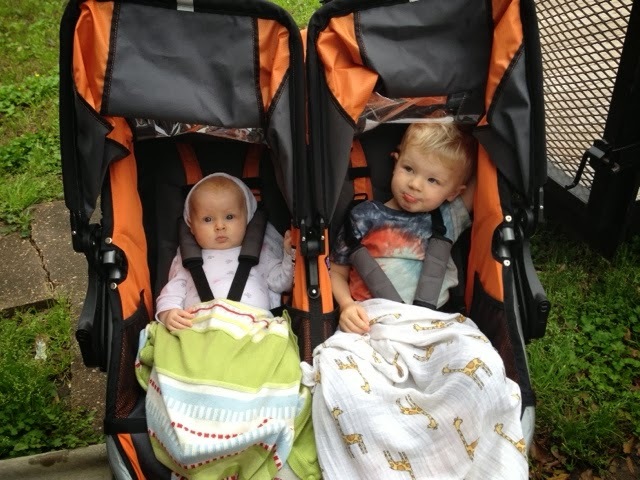 We got ourselves outfitted with a double Bob stroller. I was so excited about it. Oh the walks and the jogs and the Sunday strolls! I rolled the rig out for our first ride, nestled the baby into it, and she immediately started freaking out. I have never seen Lucy June so mad. My first thought: "My life is over." And I started crying. This possibility had literally never occurred to me. Jake was the fussiest baby in the world and he liked a jaunt in the jogging stroller almost as much nursing. The cries of my chicklet in the jogging stroller were like the death knell of my sanity. So I powered through, and she made peace with Bob, and all was well. My middle name should be "overreact." When do you get better at rolling with it? Three kids? Four? Just a leeeettle bit snug about the hips. Now I will go buy some on Etsy. Or what's more likely: I will try the DIY route just one more time, have another frustration, and then go to Etsy. Why? Why am I like this?? We didn't get ashes on Wednesday because somebody didn't talk to somebody else and it was the first Mass of the day and somehow the church didn't have them. Jake almost threw a fit and a half when he realized we weren't getting ashes (I'd talked them up for days.) We were the only people sporting kids to the 6:45am Mass, so we were attention grabbers. Fun fun fun for everyone. So they gave us "spiritual ashes." Can they do that? I'll go ask Kendra. I'm trying to maintain my early rises for Lent. I love getting up early and savoring a cup of coffee in the quiet, so it hardly qualifies as mortification. Yesterday morning the baby woke up two minutes after I wiggled out of bed, and so I went back and nursed her down and tucked her into Jacob's armpit. Then I went back to the kitchen and had just finished making my coffee when the toddler was awake for the day. He gets to come out of his room in the morning when his Christmas lights come on, so while he waited, he played with trucks and crooned his version of "That's Amore" - and at 6:45am, I didn't amore it. Despite foiled mornings, I will keep it up because Lent and because most mornings end up being rewarding, and even when they aren't quiet and rejuvenating, at least I don't wake up in a tempest of needy children. You'll notice if you gander slightly North on the screen, that the old blogspot is now a .com. It took all kinds of fretting: rhodeslog.com vs. therhodeslog.com and the like. In the end my brother-in-law just told me to buy both, and in an unprecedented act of overspending and good sense, I did just that. 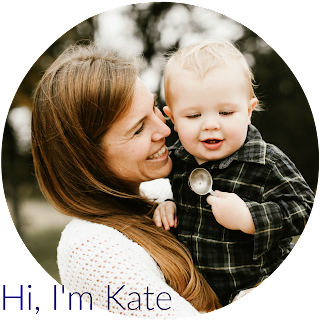 Now of course I'm considering a name change because the blog's name is all kinds of boring. When I first started the blog I spent weeks trying to pun on our oh-so-punnable last name, until I was so frustrated I decided to just call it "The Rhodes Blog." Anyhow, just before I named my blog "Blog," Jacob said, "At least call it The Rhodes Log" - and the blogspot was mine five seconds later in a huff. Jacob has talked me off the renaming cliff for the time being. I'll revisit it after Lent.